Month two of The 5 Obstruction Blogathon and we are challenged to write a review of a movie and include an interview. I get a gold check mark if I am able to interview a person involved in the movie. Well, fortunately, I didn’t have to go to far to find a quality interview. On a recent trip to LA, my brother ran into one of his high school friends, Mr. James Lopez. James is a studio executive at Screen Gem a division of Sony Pictures. He was generous enough to answer my amateur journalist questions and I think I got some good stuff. Hope you enjoy. 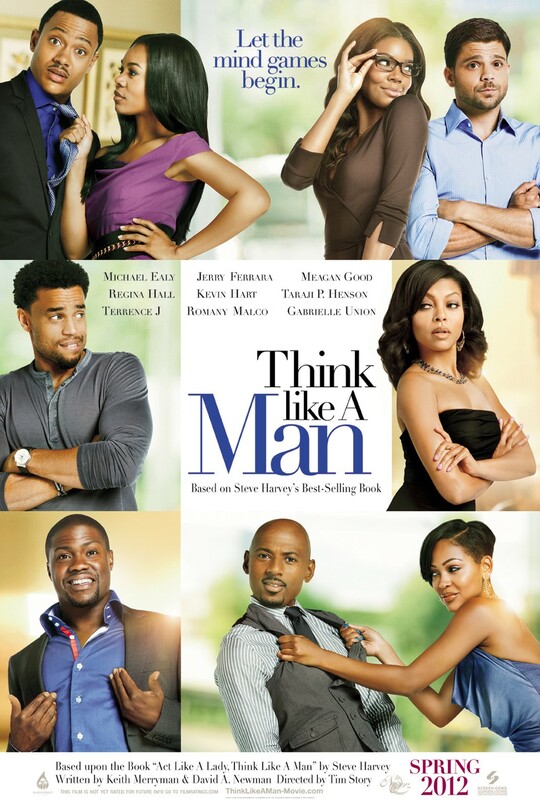 Think Like a Man chronicles the relationships of four guys attempt to get back at their women once they discover they are being manipulated by the mandates in the book, Act Like a Lady and Think Like a Man by comedian Steve Harvey. As the Studio Executive on this film, James’ responsibilities covered the time frame from acquiring the project for Screen Gem to the films release and every step in-inbetween. While I didn’t want to bust my own magic movie bubble, I was fascinated by how this self help book with no characters was transformed into an ensemble cast motion picture. James credits the writers in creating the unique take on the project, which was essential in getting the movie green lighted. As a writer, I am fascinated with the timeline and process of a book from idea to publication. I asked James to give me the rundown of Think Like a Man’s journey. The book was published in January of 2009. Producer tracked the success of the book. The producer bought the movie rights to the book. Screen Gem optioned it for a movie. Writers were hired to determine how to craft a screenplay out of a book with no characters. Studio liked the idea of the book becoming a living character in the movie that guided the actions of these characters. The script is written and it is to long. Comedy writer is hired to punch up the comedy. Table read (hire actors to do it, but not necessarily the actors in the film). They are looking at timing and to see how the dialogue plays out. Where it gets a laugh or it just lies there. Green Light the movie – where the money comes in. For a picture of this size and with this type of cast, once green light, the movie came about fairly quick. They must have done something right because the movie was a great success. The movie cost $12 million to make and grossed over $90 million in the domestic box office. I had to ask James if he could tell me anything about the sequel. He was tight lipped, but he did let me know the entire cast will be back for the sequel and an addition of Wendi McLendon-Covery from Braidsmaid. Again, a choice championed by Mr. Lopez. Look for more instant classic’s from James Lopez (I’ve know him since I was 10, how cool is that) in 2013 and 2014 such as Battle of the Year (release in September 2013), About Last Night (remake of the Rob Lowe/Demi Moore 80’s classic release in February 2014) and Think Like A Man 2 (release in June 2014). Have you seen Think Like A Man? What did you think? Very cool. Thank you very much. I”ve never seen the production of a movie laid out like that before. That is way cool! Thanks for sharing. I learned so much. Also, the blog looks awesome. Wow, you got the inside scoop! That’s a lot of steps in the process. I know. It’s a wonder anything gets done in Hollywood.